Simply put – You Save Money. Why? Because SolaRay heating panels are 35%-50% more efficient than wall or baseboard heaters. So your heating bill is lower and you save money every year. What’s more, SolaRay ceiling-mounted Far Infrared (FIR) radiant heating panels provide an incredibly comfortable, gentle, sun-like heat that eliminates cold spots and drafts. And they are inexpensive, install as easily as a light fixture, require no maintenance, allow furniture placement anywhere unlike wall and baseboard heaters, and operate completely silently. So make the Smart Choice today! Wall and baseboard heaters are the most inexpensive heaters on the market today with a low initial cost. But why settle for the cheapest heaters on the market when you can have the best? While SolaRay panels are slightly more expensive to purchase, their energy savings quickly repays any higher product cost. 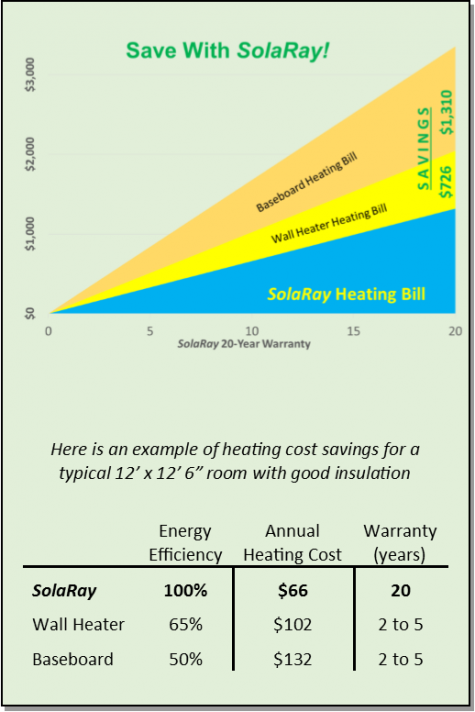 In fact, in just over 3 years, a SolaRay heater will pay for itself compared to a baseboard heater and in just 7 years compared to a wall heater. Trouble Free – No filters to change so you can enjoy hassle-free lifetime operation. Lifetime Warranty – SolaRay heaters also have an incredible 40-year lifetime according to the NAHB. Easy to Install – No expensive ducting needed. Installation is as easy as installing a light fixture. Frees up Space – SolaRay’s ceiling mounted panels allow you to place furniture anywhere in a room unlike wall or baseboard heaters. Zone Controllable – Customize the perfect heat for you room by room. Once turned on, within minutes you feel warm. Silent Operation – Perfect for bedrooms, SolaRay panels are silent unlike noisy wall heater fans that disturb sleep. Safe & Clean – SolaRay Far Infrared Heating panels are completely dust and allergen free unlike wall and baseboard heaters which circulate these pollutants in a room. Plus ceiling-mounted SolaRay panels are safe for kids and pets!